​Madigan is to Illinois what his late mentor, Mayor Richard J. Daley, was to Chicago, the state’s great metropolis - a city the political boss once controlled down to the last garbage truck. As speaker for all but two years since 1983, Madigan has directed the fate of key pension, labor and tax laws. As state Democratic Party chairman since 1998, he has shaped the fortunes of his allies and stymied opponents. Its pension system, serving more than 815,000 public employees and retirees, was tied with Kentucky’s system for the lowest funding ratio among states, at 37.6 percent, according to a 2014 ranking by Pew Charitable Trusts. Unfunded liabilities stood at $129.8 billion last June, up from $2.5 billion in 1971, the year Madigan joined the legislature. Pension obligations are now projected to consume about a quarter of state operating revenues every year through 2044, raising the specter of steep tax hikes or deep cuts to public services. The state’s unpaid bills could reach $47 billion by 2022, Republican Governor Bruce Rauner’s administration has predicted. Madigan’s spokesman, Steve Brown, said past governors, fellow House members and state senators, often from both parties, all signed off on the same laws and budgets that Madigan supported or sponsored. “There is shared responsibility for all,” Brown said. As the latest governor to tangle with Madigan, Rauner has said the speaker needs to own up to his outsized role in the state’s crisis, given Madigan’s long tenure and unique clout. Rauner declined requests for an interview about Madigan. Madigan emerged relatively unscathed from an epic battle for power with Rauner and the Republican Party in the 2016 elections, amid record campaign spending. Between January and November, the governor, his wife and his campaign fund gave at least $37.5 million to candidates and groups, many of which targeted Madigan in a torrent of television attack ads, state records show. The speaker’s Democratic majority lost four of its 71 House seats in the 118-member chamber. But Madigan scored a victory by helping engineer the defeat of the governor’s choice for comptroller, the office that disburses state funds. Before it was overturned, Madigan’s attempted pension overhaul angered his union-heavy base. Now, Madigan is appeasing those longtime allies by fighting off Rauner’s efforts to weaken collective bargaining rights for public-sector unions and worker’s compensation laws. Two weeks before the Illinois legislature adjourned without passing a budget last May, Madigan spoke to a crowd estimated at 10,000 supporters outside the state capitol. “Noooo!” came the rowdy response. 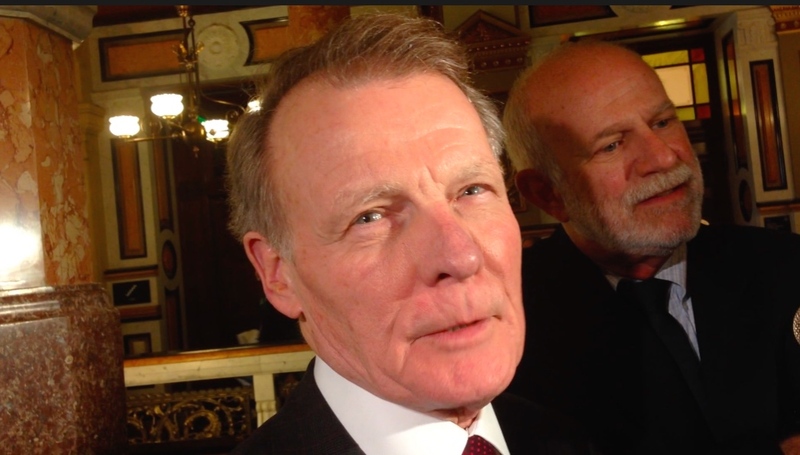 Speaker Madigan ponders a reporter's question after a House committee hearing in 2014. Public jobs, salaries and benefits have been central to the mounting fiscal crisis. Laws and budgets passed on Madigan’s watch have added tens of billions of dollars to the state’s pension underfunding. In 1989, Madigan supported a law that permanently awarded compounding 3 percent annual increases in pension payments, which can make a retiree’s yearly payout double over 25 years. Some retirees praise Madigan for his hand in the pension perk. In 2002, Madigan sponsored legislation that allowed thousands of state workers to retire as early as age 50 with full pensions. Initially, the state projected that about 7,400 workers would take advantage of the one-time offer. But more than 11,000 workers signed up, at a projected cost to the state of $2.3 billion through 2045. The state has made efforts in the Madigan era to control unfunded pension liabilities. But some of these merely shifted billions of dollars to the state’s general obligation debt, which skyrocketed from $7.62 billion in 2002 to $27.8 billion in 2016. The state borrowed a total of nearly $17 billion to make pension contributions between 2003 and 2011 under legislation sponsored or supported by Madigan. In 2010, Madigan teamed with Quinn, the Democratic governor, to pass a law that cut pension benefits for employees hired after 2011. That will save the system substantial money once those workers retire. But for decades to come, the state will continue to shoulder higher costs of pensions for workers hired before 2011. And a little-known provision of the law allowed the state to slash pension contributions immediately, using the projected long-term savings as the rationale. The law was cited as a textbook example of the legislature’s habit of pushing urgent obligations far into the future in a 2015 analysis commissioned by the Teachers Retirement System, or TRS, the state teachers’ pension. “The state has systematically underfunded TRS using Illinois Math,” the report stated. In an interview, Quinn said the law would eventually save billions of dollars and that Madigan played a key role in passing it. Pension legislation Madigan helped draft decades ago continues to haunt Illinois. An example is the 1994 overhaul known as the “Edgar Ramp,” after Governor Jim Edgar. The politics of the law were unique. As the 1994 election approached, Edgar faced a reelection challenge from Democratic Comptroller Dawn Clark Netsch. Madigan had backed a rival to Netsch in the Democratic primary race. Netsch was planning to use the pension crisis against Edgar. Madigan came to the Republican governor’s rescue by helping him pass a pension change in an election year. Madigan was trying to shore up his own power, Edgar said later. The speaker needed to protect the reelection prospects of his Democratic allies in the House from public employee unions angry about their underfunded pensions. “Madigan was always looking out for his members,” Edgar said in an interview with Reuters. The surprising alliance helped keep Edgar in office. It didn’t work so well for Madigan, who lost his Democratic majority - and his speakership for the only term since 1983 - as Republicans made sweeping gains nationwide. The resulting law contributed to a meteoric rise in unfunded obligations. The “ramp” promised bigger pension contributions – but phased them in slowly until 2011. In the intervening years, unfunded liabilities shot up by $57 billion. Those phased-in increases were the “primary driver” of the added liabilities, according to the U.S. Securities and Exchange Commission. In 2013, the SEC accused Illinois of understating the risk of pension shortfalls and misleading the holders of $2.2 billion in state bonds between 2005 and 2009. The 1994 Edgar Ramp law “enabled the state to shift the burden associated with its pension costs to the future,” the SEC wrote in its complaint. The state settled by agreeing to better disclosure but admitted no wrongdoing. Edgar, in an interview, praised Madigan for working with him. He faulted his successors for passing laws that weakened pensions and for failing to recalibrate contributions during economic downturns. House Speaker Michael Madigan fields reporters' questions outside the governor's office in this 2016 photo. Soon after Rauner’s 2014 election, Madigan met the governor-elect for breakfast at the Chicago Club, an old private institution catering to the city’s business elite. As they ate, the speaker handed Rauner an index card listing the seven governors with whom Madigan had served, according to three people with direct knowledge of the meeting. The message was clear, these people said. Madigan aimed to outlast Rauner, too. Brown, Madigan’s spokesman, said he was not aware of the episode with the index card. Madigan has blocked his proposals to weaken collective bargaining and workers’ compensation rights, portraying Rauner as an enemy of the middle class. The speaker also has stopped the governor’s attempt to impose term limits for legislative leaders and to change how legislative district boundaries are redrawn every 10 years, a process Madigan has used to help elect Democratic allies. Rauner’s predecessors can relate. 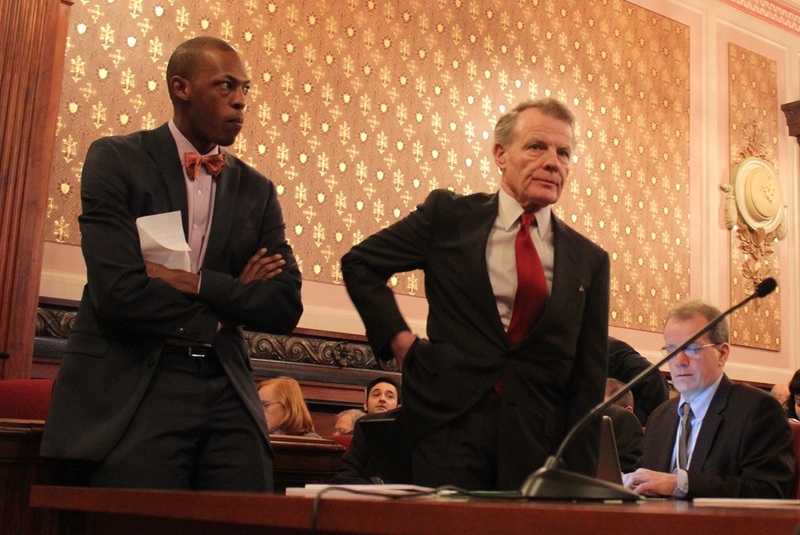 It is difficult to point to any major state law that has passed without Speaker Madigan’s blessing. In 1989, Republican Governor James R. Thompson had tried and failed to pass a 20 percent increase in individual and business income taxes, along with a new sales tax on services, through Madigan’s House for two years. Madigan undermined the governor by passing a substitute plan in less than six hours. 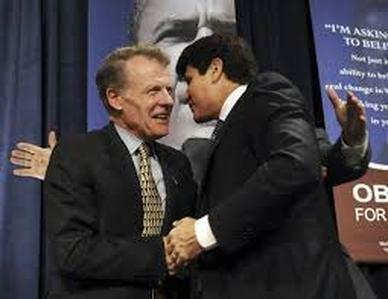 His top aides called the maneuver “Operation Cobra,” because Madigan had kept it secret even from close allies. It raised rates 18 percent, but only temporarily. Desperate for revenue, Thompson signed Madigan’s package into law. “Mike is one smart guy,” Thompson told Reuters, admiring Madigan’s legislative acumen decades later. Ex-Mayor Richard J. Daley and wife Eleanor vote in this 1963 University of Illinois at Chicago photo. Early in his career, Madigan’s political connections got him a job on the back of a garbage truck, the speaker said in a 2009 interview for a University of Illinois at Chicago oral history project documenting the life of Mayor Richard J. Daley, who served as mayor from 1955 to 1976. He got the patronage job because Madigan’s father worked as a ward superintendent, an unelected position dedicated to monitoring neighborhood garbage pickup and street-cleaning. 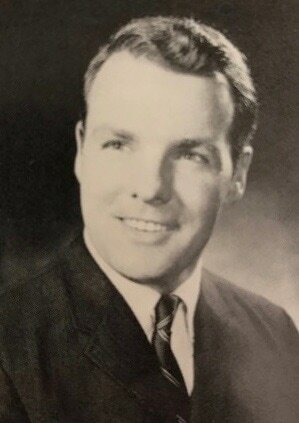 Later, when Madigan was a law student at Chicago’s Loyola University between 1964 and 1967, the mayor got Madigan a job in the city’s law department as a clerk. By 1969, Madigan was giving out jobs himself as a ward committeeman under Daley, rewarding people who helped hustle Democratic votes, the speaker told historians. He quickly learned about party discipline. After Madigan ran against a Daley-backed candidate for a higher party post, Daley refused to speak with him for nine months. Daley ultimately backed Madigan’s first run for the state legislature. Madigan said he keeps a mass card from the 2003 funeral of Daley’s wife on his office desks in Springfield and in Chicago. The card shows the mayor and Mrs. Daley at their 35th wedding anniversary. “When I’m sitting there and trying to make a tough decision, I’ll look over at him and just ask myself, ‘What would he do?’” Madigan said. Madigan has continued to apply Daley’s lessons in patronage. People with connections to Madigan, for instance, regularly have landed jobs at two transportation agencies serving the Chicago area, according to a task force appointed in 2013 by then-Governor Patrick Quinn to investigate political influence on such hires. In 2011, the Regional Transportation Authority hired Madigan’s son-in-law, Jordan Matyas, as a $130,000-a-year lobbyist. The agency denied at the time that the family connection played any role. Matyas declined a request for comment. Alex Clifford - the head of Chicago’s commuter rail agency, Metra - alleged in a 2013 memo to the agency’s board that, in 2012, Madigan used an emissary to lean on the agency to give a pay raise to a Madigan campaign worker and donor and to hire another unidentified staffer. Madigan acknowledged in a 2013 statement that he tried to get his campaign worker a raise, but he said he backed off when Clifford balked. Clifford contended his job was threatened by two board members aligned with Madigan. He ultimately agreed to leave the agency when the board gave him a controversial $718,000 severance package. Quinn, a Democrat, created the task force in 2013 to “restore trust” at Metra. Its final report detailed an additional 26 alleged instances in which Madigan or a lawyer acting on his behalf recommended people for public-transit jobs. “In some cases he did not recommend people to be hired – he in effect decided they were hired,” the report said about Madigan’s influence. The additional 26 hires came between 1983 and 1991. The task force discovered them in records the agency kept to track the hiring recommendations of politicians. Such political hires were common and considered legal in Illinois until 1990, when the U.S. Supreme Court ruled that patronage hiring by Illinois Republicans violated the constitutional free speech rights of public workers who did not support the party in power. The task force did not investigate the hiring of Madigan’s son-in-law as an RTA lobbyist, but noted that it created a “perception” problem. Clifford, now a transit executive in Santa Clara, California, described Madigan as a throwback. In a hallway near Madigan’s statehouse office, four bronze wall plaques list the 59 House speakers who have served since Illinois gained statehood in 1818. Madigan’s entry takes up far more space than that of anyone else. By August, Madigan will have outlasted the longest-serving house speaker in modern U.S. politics, the late Solomon Blatt, who ran the South Carolina chamber for 32 non-consecutive years between 1937 and 1973. Last month, Madigan celebrated his tenure by giving each of the members of his Democratic majority a crystal clock that retails for $150. Omitted from the gift list was Scott Drury, the only Democrat who did not vote for Madigan’s reelection as speaker. Instead of a gift, Drury said, he got stripped of his committee leadership position in retaliation for stepping out of the party line. Michael J. Madigan in the 1971-1972 Illinois Blue Book, his first official state portrait. CHICAGO (Feb. 8, 2017) -- As Illinois House speaker for more than three decades, Michael Madigan has often worked to raise people’s taxes. As a private attorney, he works to lower them. Madigan & Getzendanner is one of Illinois’ leading law firms for clients filing appeals to contest their property appraisals in an effort to reduce their real-estate taxes. Between 2004 and 2015, the speaker’s firm won $63.3 million in refunds for clients, according to a Reuters analysis of data from the Cook County treasurer’s office. In 2015, Madigan’s practice ranked second among law firms in total property tax refunds, the county data shows. Madigan’s chief political rival, Republican Governor Bruce Rauner, has said Madigan’s law firm poses a conflict of interest for the speaker. Rauner alleged the conflict as legislation he supported to freeze property taxes stalled in the House, which Madigan and his Democratic majority controlled. “Mike Madigan is making millions – millions – from his law firm from high property taxes,” Rauner told reporters in June 2015. Madigan, who declined to be interviewed for this report, has in the past denied any conflict of interest. Madigan’s spokesman, Steve Brown, said the speaker scrupulously follows all ethics laws and has strict personal standards. Madigan & Getzendanner did not respond to inquiries from Reuters. On its website, the firm says it specializes in major commercial properties, such as office buildings, hotels, shopping centers and industrial sites. Decisions on the property values used to calculate taxes are made by the Cook County assessor, Joseph Berrios. Property owners can appeal to Berrios’ office about his assessments or to separate boards with the county and the state. Businesses and homeowners often hire law firms to make their cases for tax reductions with those entities. A former state representative, Berrios is chairman of the Cook County Democratic Party, a post he assumed with help from Madigan, who is a voting member of the county Democratic organization. Berrios is also an investor in a lobbying firm with clients that have business before the legislature in Springfield. Berrios’ daughter, a former member of Madigan’s House Democratic caucus, is a registered state lobbyist. Berrios spokesman Tom Shaer said the assessor recuses himself from any decisions in cases involving Madigan & Getzendanner clients and has not dealt directly with Madigan on an assessment matter during more than six years in county office. Madigan co-founded his law firm in 1972, just as his career as a state legislator was getting started. Madigan & Getzendanner’s client list grew to include firms with ties to the state, as well as political donors. At least six financial institutions that Madigan & Getzendanner listed as clients last year on its website have ties to Illinois pension systems. They have donated more than $109,000 since 2000 to the speaker or to his daughter, Attorney General Lisa Madigan, state campaign records show. A spokesperson for Lisa Madigan declined to comment. Madigan & Getzendanner previously listed clients on the firm’s website, but that online list disappeared after Reuters began inquiring about the firm’s clients last year. Illinois is not among the 26 states that require lawyer-legislators to disclose information about their clients. In fact, Brown said, an Illinois Supreme Court rule bars lawyers from disclosing clients’ identities without permission. This shot from photographer Lee Milner is one of my favorites. It shows "The Hug," the incredibly awkward moment at the 2008 Democratic National Convention in Denver when then-U.S. Rep. Jesse Jackson prodded the speaker and former Gov. Rod Blagojevich to end their hostilities toward another, if only momentarily, by hugging. The Illinois delegation went wild. Madigan answers questions after pushing legislation to earmark $120 million toward President Barack Obama's presidential library. In this AP photo, in which I have an unwitting cameo, Madigan prepares to testify on pension legislation he favored before the Senate Executive Committee in Springfield. Above is the segment I produced for an investigation I did with the Better Government Association, examining how frequently Madigan's petition circulators wound up on government payrolls, their seeming rewards for doing work in the speaker's powerful political army. After the story's publication, Madigan attacked the BGA, accusing the organization of having a political "agenda" against him.